You are cordially invited to our last meeting of the year on December 7, 2013 from 10-12 at the Fremont Public Library, Jackie Bernier Dr., Freemont, NH. 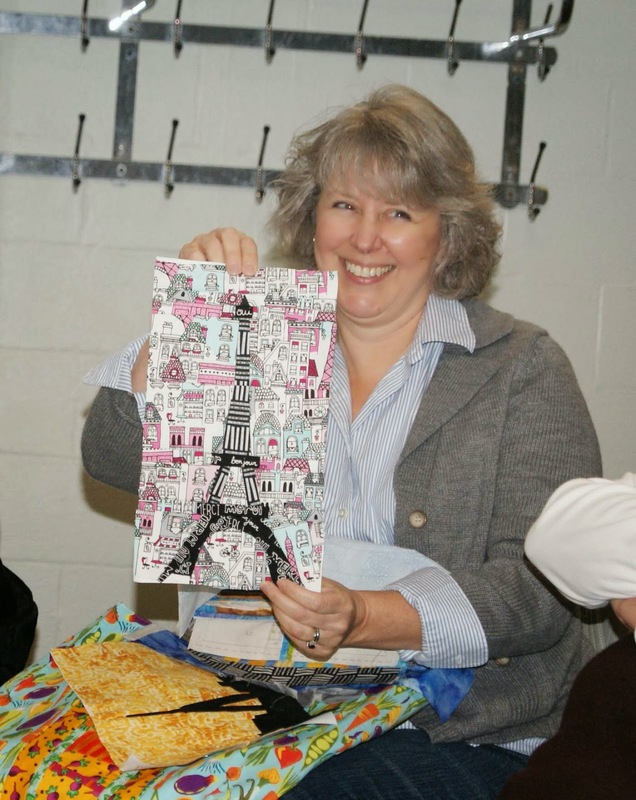 We will be celebrating our first full year as the Seacoast Modern Quilt Guild! All members are asked to bring a menu item for a potluck brunch. Robin will provide the paper goods. We will also have a Yankee Swap so please bring something in a gift bag (rather than wrapped in paper) that is handmade or sewing notions/fabric with a value of approximately $15. This should be a lot of fun! Please remember to respect the religious beliefs of other guild members. This is not a Christmas party so please do not use Christmas wrappings or bring overtly Christmas themed food or gifts. Thank you. And finally, don't forget to bring your membership check for the 2014 year made out to the Seacoast Modern Quilt Guild in the amount of $50. These officers will take over at the January 2014 meeting. Dues will increase to $50 a month and are due by the December meeting. Hi everyone! 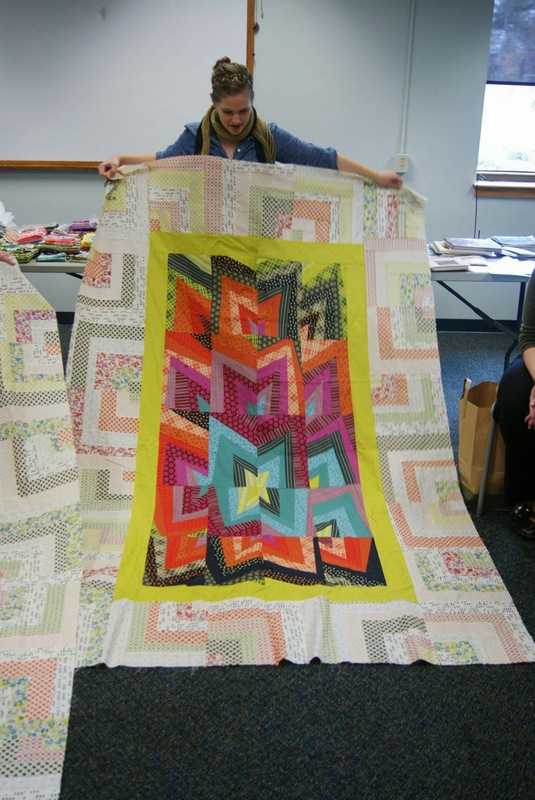 Not that you need reminding about this, but just in case, Lizzy House will be visiting the Seacoast Modern Quilt Guild on Saturday, November 23 from 10-12 noon. Doors will open at 9:45 (please try not to arrive too early because we need time to set up!). Refreshments will be provided courtesty of the SMQG and the Boston Modern Quilt Guild. All are welcome! Guild members will be admitted for free, visitors will pay a $10 entrance fee. The lecture is at the 1910 Building, Town Annex at 381 Main Street, West Newbury, MA 01985. There is additional parking at the rear of the building. In addition to Lizzy's talk, we have 4 door prizes courtesy of Soak. As you might know, Lizzy is one of their designers and has designed the Yuzu label and curated a nail polish collection. We will have a large bottle of Soak, a twosome 3 oz of Soak and Handmaid, Yuzu Flatter and one of Lizzy's Nail Polish Soakboxes to share! Don't forget to pick up your door prize ticket as you enter. 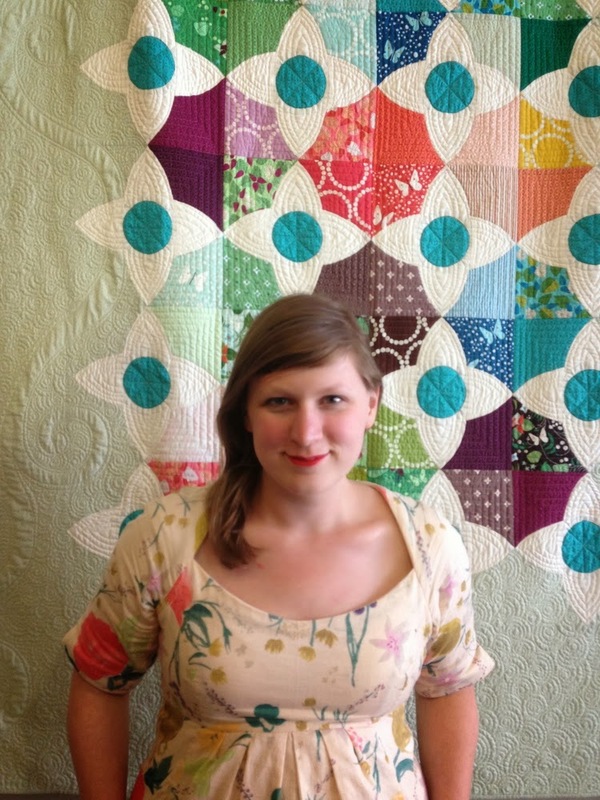 Virginia from Gather Here in Cambridge will be vending at the lecture. She will have collections of Lizzy House's fabric and coordinating Kona as well as Soak products. 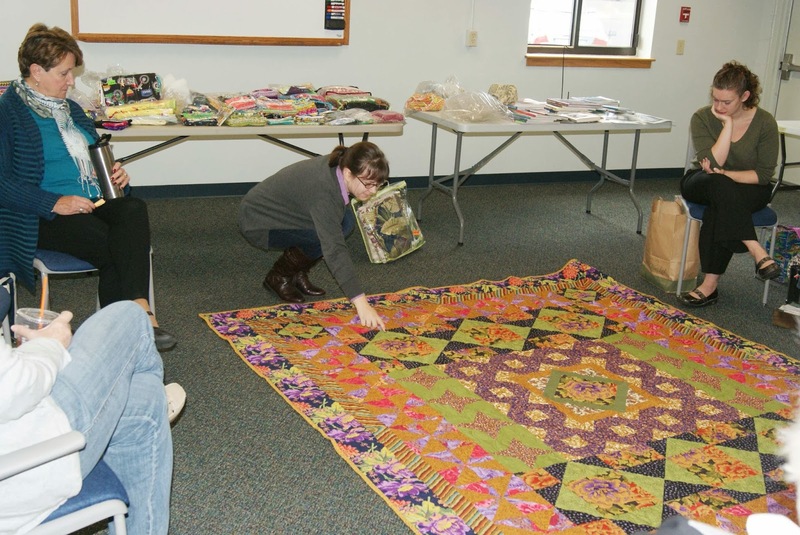 Our November meeting was held at the Stratham Public Library in Stratham, New Hampshire. 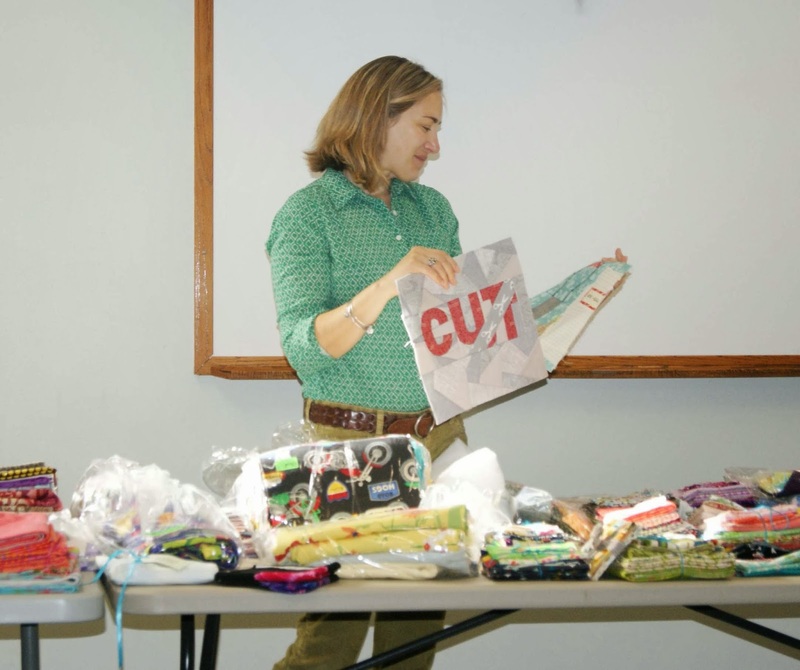 We held our annual business meeting, and our first WIP/scrap/supply auction to benefit the guild. 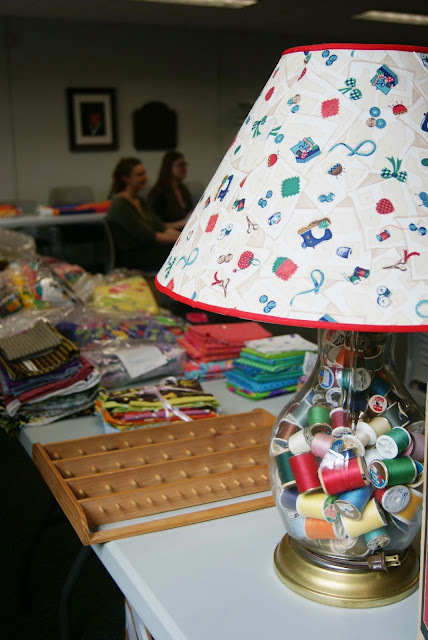 The photo above is of the gorgeous lamp that Sue Ann made to donate to our guild. It is amazing, and looks sweet on my very own dresser right now! Amy began the meeting by taking volunteers for refreshments at the Lizzy House lecture on November 23. Thank you in advance if you signed up to bring a snack or a drink! Gather Here will vend Lizzy House fabrics and some coordinating solids at the lecture. Soak has donated some goodies to be used as door prizes. We hope to see everyone there--and please feel free to invite guests! The Riley Blake challenge deadline has been extended until February. Our projects will be due at the February meeting, and photos are due on the MQG website in February. For our December meeting, we will hold an end-of-year celebration! 2013 was our first full year as a guild, and it's been a great one. We'll celebrate with a Yankee swap--please bring a fabric or notion gift worth about $15, or a small handmade gift item such as a pouch--and come ready for fun! We'll be holding a potluck brunch as well, so please come hungry and with something breakfasty to share. Stephanie showed off her Broken Herringbone quilt top at Show and Tell. 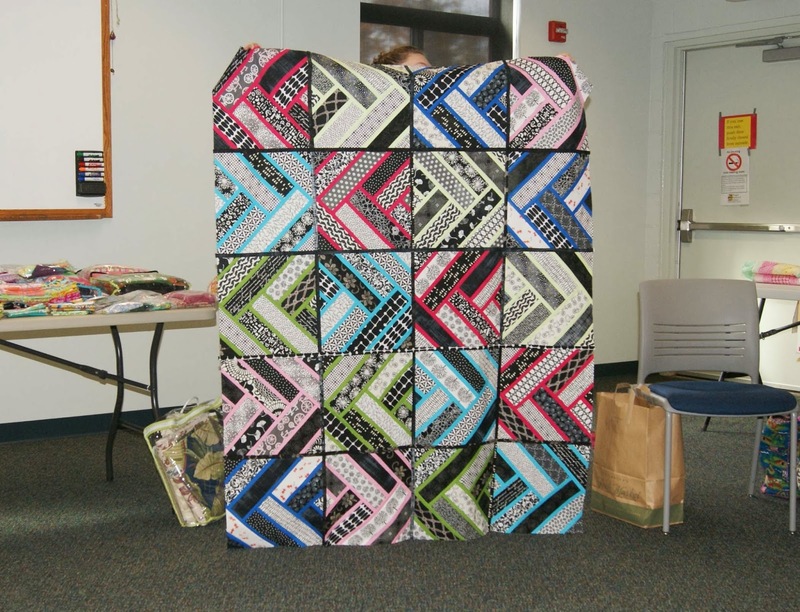 She used bright solids for the sashing and black and white prints for the "bricks"--very different, and very lovely! Jessica found this lovely vintage sewing machine FOR FREE and had it fixed up. 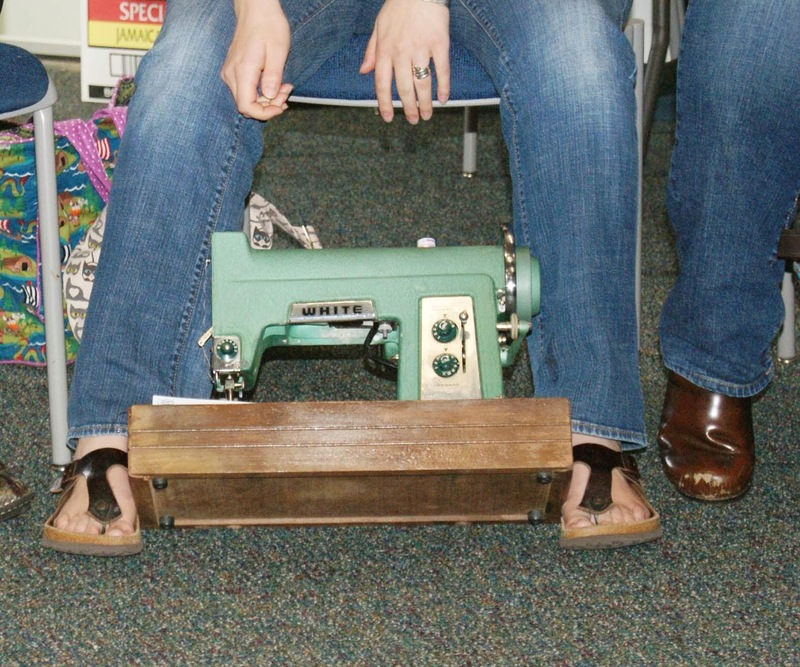 It sews! I love the green color of the body, and the wooden base. What a find. Amy showed off her Halloween quilt. She was able to design such a smart quilt around those large novelty prints, keeping them intact so you could read the cute labels on the Halloween bottles. The angles on the edge are my favorite part. And a BIG pile of paper-pieced blocks she made for the Big City Girl QAL. I think we all loved her Paris block the best, though you can also see her Zakim bridge block in her lap (designed by our own Amy). I can't wait to see this project all together, Nancy! In the spirit of the "clear-out-your-stash" auction, Samantha dug up a cut of monster fabric she bought to make a quilt for her nephew. 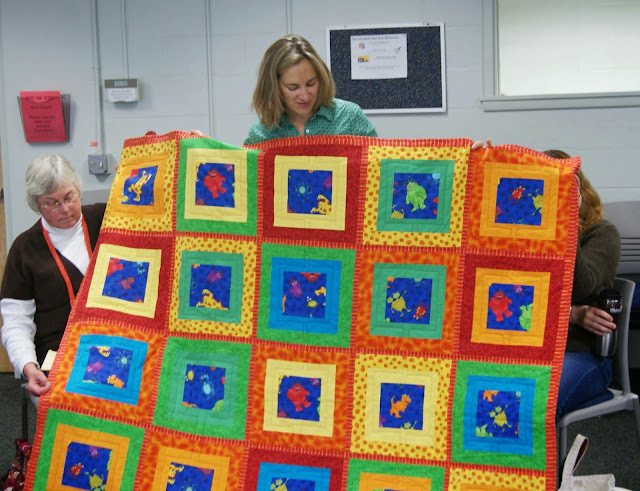 Her nephew just got his drivers' license so she repurposed the fabric to make a bright and appealing quilt for one of her sons. What a great use of those funny monsters. Kali showed off her first quilt. It was a bit difficult to photograph because it is a king-sized quilt! 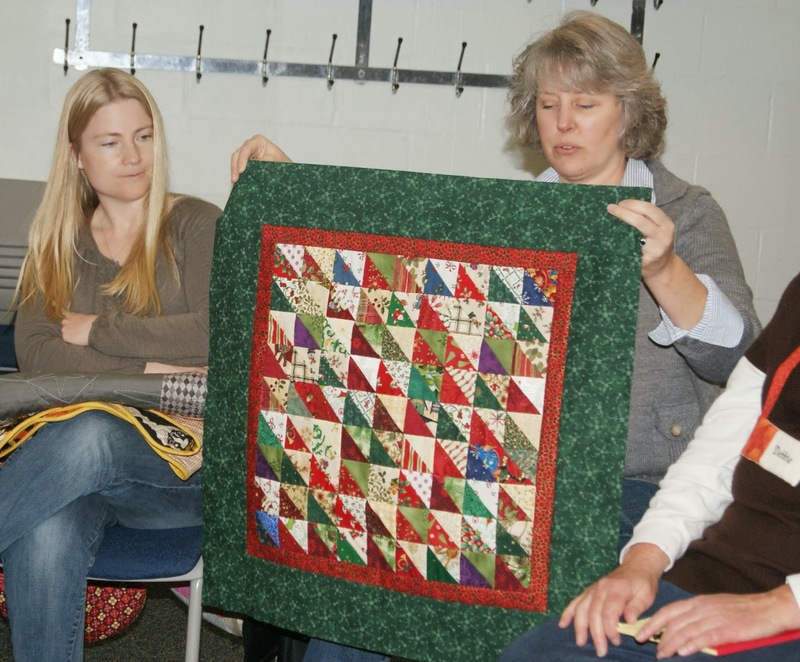 She started with a small cut of the fabric in the very center diamond medallion, and designed the quilt around that little bit of fabric. She designed the borders and the medallion herself, and was able to mix in a variety of coordinating fabrics. In the end, she found more of her feature fabric--and was able to buy 9 yards for the back! Samantha did a fabulous job as auctioneer. I left feeling like a winner, and I was also able to unload a boatload of scraps. I hope others felt half as successful as I did! We raised a total of $209 to go towards our national MQG dues, which is quite substantial. I know I hope this auction becomes an annual event--I have WIPs earmarked for donation if they don't get done this year! 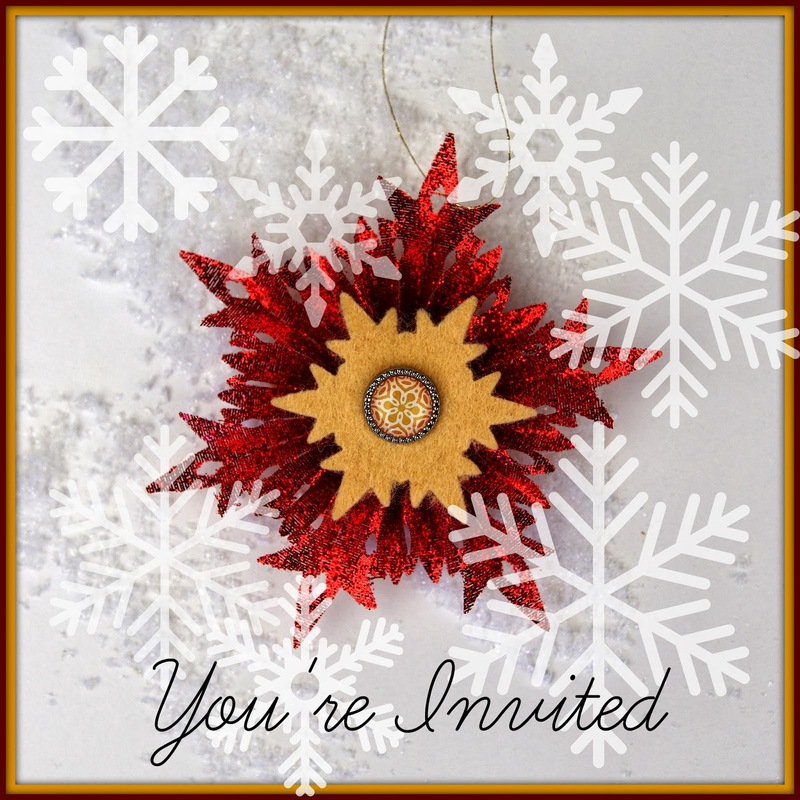 If you weren't able to make the meeting, hope to see you at Lizzy House in West Newbury on 11/23, and at our December end-of-year gathering at the Fremont Public Library in Fremont NH!